One thing that was acutely felt in the last Star Wars Battlefront game was the lack of a narrative-driven campaign. Walt Williams, who had previously written such games as Spec Ops: The Line, was tapped to help write the campaign in Star Wars Battlefront II. 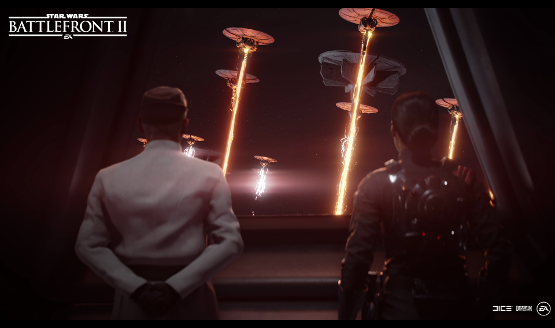 We managed to sit down with him for a quick, yet in-depth, chat about how the idea of an elite squadron in the Imperial Forces came to be, and how writing this story helped to reinvigorate his love of game story crafting. Take a read below. PlayStation LifeStyle: At this point, you are set in the story. How much creative control would you say you were given over this story, since it’s official canon? Walt Williams, Writer on Star Wars Battlefront II: Well, we like to say authentic Star Wars experience. But, we were given, honestly, I think what you’d describe as a ridiculous amount of control! You come into writing a Star Wars story for the first time, and your natural inclination is to be a little bit overwhelmed, and scared, because you don’t know exactly what you’re walking into, dealing with a company like Lucasfilm. We were, honestly, overjoyed to find them to be extremely friendly and supportive, and just amazing collaborators. When we came into the process, they weren’t sitting there saying, “this is the story we want you to tell.” They were saying, “let’s tell the story that you want to tell,” and, “how can we help you get to that point where that story an authentic Star Wars experience,” that it feels like the films, the shows, and the books. So, right off the bat, it was just a lot of freedom! What Lucasfilm is doing, ultimately, when you’re taking these stories to them, is they’re doing their best to enable you to succeed, while at the same time balancing your story against all the other stories that are currently in development. They know all the things that other people are writing, those stories, that you don’t even know about. So you’re running your story ideas by them, coming back and forth with, “yes! That’s good, that’s perfect, we love it!” Or, “we like it, but we’re not entirely sure where you’re going for with it,” or “we like it, but you can’t do that…and we can’t tell you why yet!” And you go, okay, great, fantastic, and you go from there. Honestly, working with them, has been probably one of the most rewarding experiences of my career. And it’s precisely because they come to the project with just as much excitement as you do. And these are people who work on Star Wars and have been doing it every single day for years, and they’re just as excited as we are, coming and working on our first Star Wars story. They say, you know, never meet your heroes, and never see how the sausage is made, but in this one case, it turns out, the sausage is made in an amazing way! You just want to watch it be made all the time. Honestly, they were great! PSLS: Speaking of feedback from Lucasfilm, did you guys come up with and approach them with regards to the character Iden Versio, or is that something that they wanted to write? Walt Williams: That was entirely us. We developed the character around, you come in asking, what is the story that I as a fan would be interested in seeing? As we worked on the game, TFA (Star Wars: The Force Awakens) was just kind of coming out in theaters, and so as a fan, we’re looking at, there’s already instantly this gap between Episodes VI and VII, and want to kind of fill in some of the story of what immediately happens after Return of the Jedi. For us, the most intriguing way to do that was to come at it from this angle of the Empire, because, the Rebels, we’ve seen them win, we’ve seen them celebrate, we’ve seen that story in film, even if we haven’t seen the immediate aftermath. Coming at it with the Empire, it suddenly takes these familiar scenes, and paints it in an entirely different light, where celebration becomes a darkest hour. Now, you have these characters, these Imperials, who are on the run, attempting to regroup and figure out what they can do to save this empire that they’ve built. These people genuinely believe it’s the only way to bring order and peace to the galaxy; the rebellion, the Republic, these are illegitimate governments. These are terrorists! So that became, when we were developing this idea, that was the idea that we really wanted to explore through our main character who became Iden Versio. Where Lucasfilm really came in is that, we went to Lucasfilm with the idea for the story, and the idea for the character, and explaining to them, there’ll be missions where she’s on the ground shooting, there’ll be missions where she’s flying TIE Fighters, and Lucasfilm saying, in the Empire, it’s extremely controlled. Everything is kind of cordoned off. If you’re trained to be a TIE Fighter pilot, that’s what you are. You’re not on the ground with the Stormtroopers with a rifle. If you’re a Stormtrooper, you don’t know how to fly the TIE Fighter. They didn’t train you to do that. Everyone has their role. So, if Iden can do these things, Iden has to be an elite soldier. She has to be someone that has all of these different trainings, and has them for a reason. What would that reason be? So then we take that back, and we begin to build this idea of Inferno Squad, and who this elite squadron is, and why the Empire would have created them. That’s where it came about that these hero characters on the Empire side, that originally came about after the first Death Star was destroyed. An elite, small unit that could go in and take care of missions, and adapt on the fly, and solve problems that larger battalions aren’t necessarily going to be able to go into and shoot, until they’re gone. It’s like everything in video games. It’s a back-and-forth, and you’re building something together, collaboratively. Ultimately, we ended up with Iden Versio, who we have now. A lot of this stuff, by the way, I should point out, is explained in Christie Golden’s novel, the Inferno Squad novel, which came out in July, which details the formation of the Inferno Squad, and kind of sets up who these characters are, when we meet them in the beginning of Battlefront II. Not necessary to enjoy the game, or understand the game, but a very good and enjoyable novel nonetheless. I would be remiss if I did not mention it! PSLS: It just wouldn’t be Star Wars if this wasn’t expanded upon! PSLS: You’re expanding on the storyline of the Empire. Do you find it’s more of a restriction, or more of a freedom, since it hasn’t really been expounded upon all that much in more traditional media? Walt Williams: I would say a freedom, really. You take into account, the other things that are out there, the other stories, because as you’re working on it, you have the aftermath trilogy coming out, and you have some of the comics that are going to be out, we take some inspiration from what’s going on in the timeline, from some of those stories. But ultimately, it’s like life. You have large events that are going on, in history, but the paths that people take from one moment to the next, these are the original stories of life that we’re following. Think about how many people end up in a real-life military battle. It could be from 30 to thousands, or more. Just because a thousand people end up in this one place, at one time, didn’t mean they all followed the same story to get there. Where we’re starting with Endor, you have all of these different threads that are coming together, and separating off into their own kind of tapestries. I think it’s as much freedom as you would have working in any other time period in Star Wars. PSLS: So is the end goal, for the effect that you want to have on the player, do you want them to feel like these people in the Empire are more humanized than before? Walt Williams: Absolutely! This is me, I love the idea, because we’re trained…We’ve got 40 years of training, telling us that people in Stormtrooper armor – bad. People that dress in the rebellion [outfits] – they’re good. And I want to break your mind, and I want you to look at the Stormtrooper armor, and go, “maybe not as bad?” The Empire is still the Empire. I don’t want to think that suddenly what the Empire is doing is good. But I want you to see the human inside the Stormtrooper armor. I want you to see the person. I want you to think about where they came from, [how] they might have grown up, why they might think the Empire is everything it claims to be. How someone with noble intentions and noble goals might end up in this organization, and how they might be tested in this type of situation. That, for me, as a writer, is an intriguing story to writer, and as a player, the kind of story that I look for in a game, or in an authentic Star Wars story. It’s something that allows me to look at something familiar, from a different angle, and reconsider my feelings about it. So that’s ultimately what we’re, in a lot of ways, trying to do for you, by writing an Imperial story, and making you the center of that. I think we pulled it off! But, you know, I don’t get to do the final judgement call on that, all of you do! PSLS: For you personally, what would you say that having this opportunity means to you? Walt Williams: Oh, man. Honestly, without a doubt, this has been the highlight of my career. A lot of the games that I have written in the past tended to be rather dark, and serious affairs. I wrote Spec Ops: The Line. Working on stuff like that for years at a time can be very draining, both physically and mentally, and emotionally. Working on this game has, honestly, it has filled me with…It has helped me “re-find” my love for writing games, and my passion for writing games, because it has left me feeling hopeful, and good, because there is a thing about Star Wars that you don’t get a lot of in popular video game franchises. Ultimately, these are more uplifting stories, even when you’re looking at them on the Imperial side. It’s still not a story that forces you to delve into your darkest thoughts and inclinations. Getting to explore that galaxy and the characters in it, and different worlds and mindsets, and everything…It was such an invigorating experience to work with [Co-Writer] Mitch [Dyer], and Motive, and Lucas. There was a point, prior to working on this game, where I could have seen myself getting out of games, and just doing something else. And now, I don’t ever really want to stop, because it really has been the best writing experience of my career. And that’s entirely because of the amazing people that I’ve been working with. They’ve all been fantastic! So…that was a really personal answer to that question! But it’s the absolute truth. That’s what writing this game personally means to me. It has filled me with as much hope as I think Star Wars itself fills its fans with, and the characters in the universe are filled with. It’s been really, really cool to have that carry over to me in my real life. It’s been amazing, and surreal. PlayStation LifeStyle would like to thank Walt Williams for taking the time to speak with us, and to Electronic Arts for reaching out for the coverage opportunity at their offices. Star Wars Battlefront II launches on November 17, 2017.